Bologna has long been known as a centre of culture. Historical buildings, well preserved architecture and great transportation links all add up to this city being a destination for creative fairs and tourism. Little wonder it was voted European Capital of Culture in 2000. 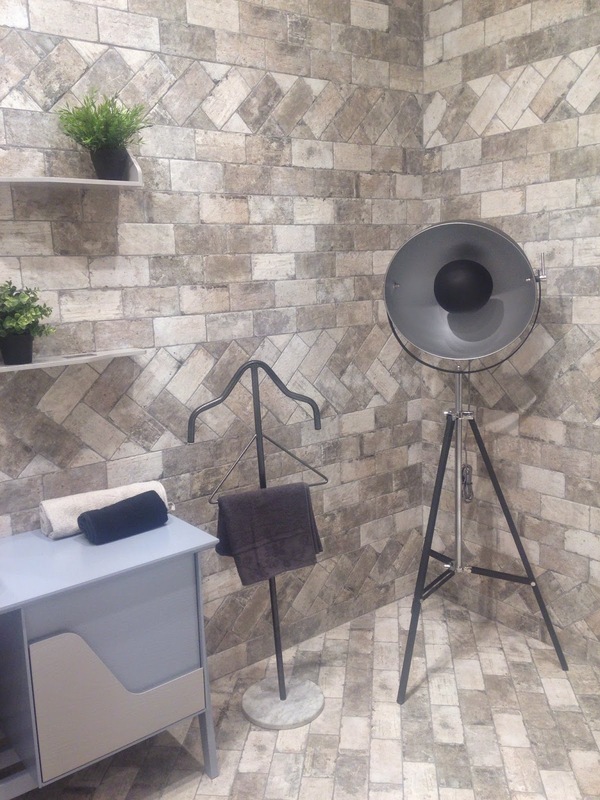 Cersaie is a firm fixture in the ceramics world calendar. Major suppliers showcasing what is new and bold in the world of porcelain, ceramics, glass, designer walls, bathrooms and fittings. There was certainly a lot to see. 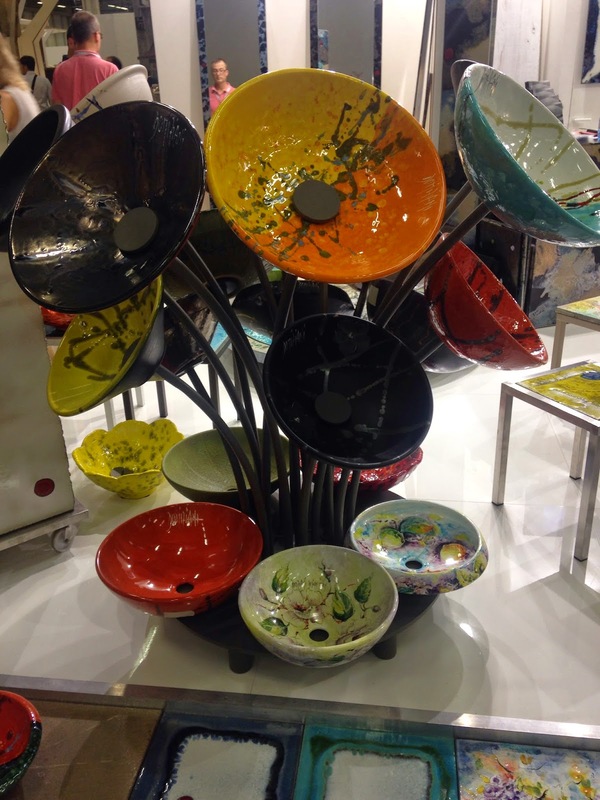 Glass glazed ceramic tiles and funky displays of lava basins made appealing and interesting displays. There was certainly a fair amount of lava products on show. Whether the material was used as wall tiles , or cast as basins or worksurfaces, this was certainly an interesting product. I really liked the bricks on show. Whether they were porcelain or designer brick, there was something really appealing about them. Not only were there different sizes and shapes- but some really exciting colourways and suggestions for patterns. I'm quite into the designer brick- and very excited one supplier. Something a little bit different. We saw at Decorex a few years ago a bit of gold/ brass displayed in bathroom hardware, this year a bit more in Bologna. It's a resurgent market, impressed to see some really good partnerships hardware and sanitaryware. 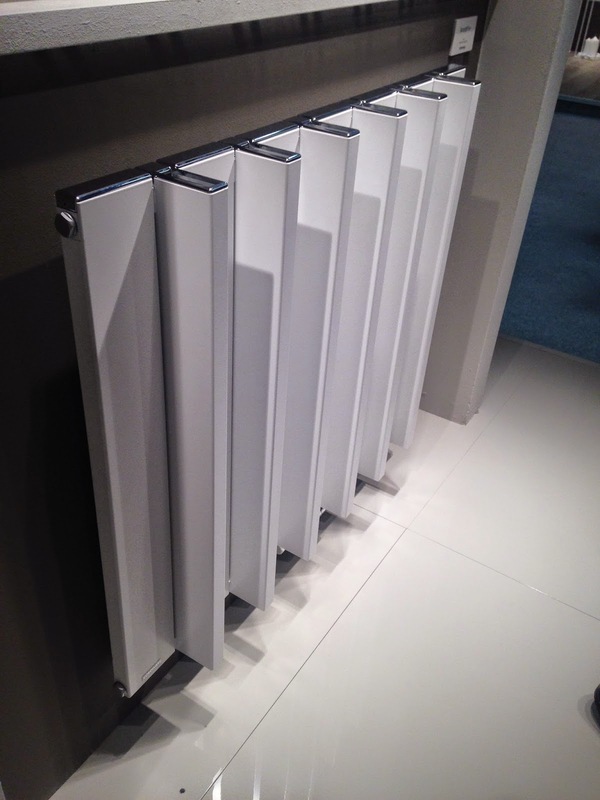 How can you not love these radiators by Ridea Schema Bird. 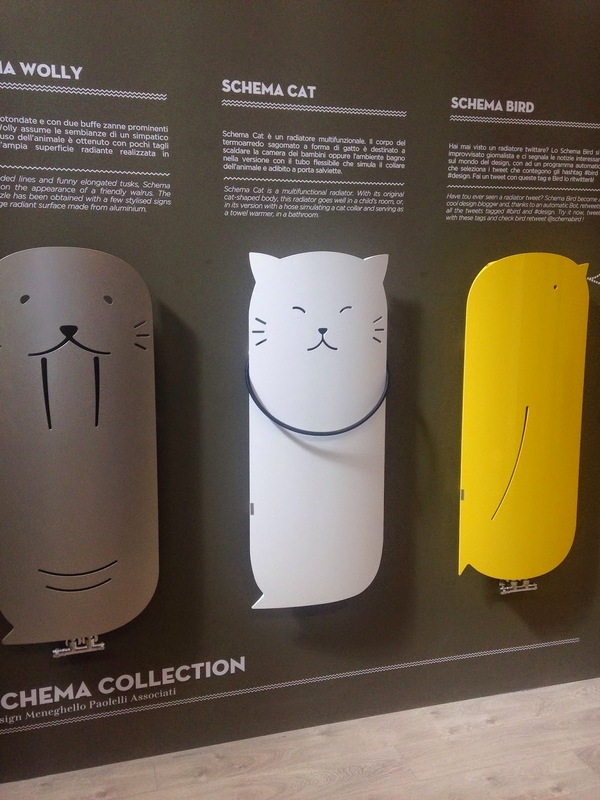 There is Wolly, Schema Cat and Schema Bird- who incidentally was tweeting through Cersaie 2014 . Who says radiators need be boring. We tend to think of heating in this country as being wall mounted boring white, or portable grey blowing hot air. There are alternatives, and some imagination and great designs. Excited was I by Cordivari, Italian style fantastico, shown here. Fiore, a Spanish company with electric and water heaters and again great designs. My journey continued to visit Tubes Radiatori. So here I am in a 16th century palace Ex Ospedale dei Bastardini in via D'Azeglio in Bologna, it's the Bologna Water Design festival. The building itself is beautiful, courtyard, vaulted ceilings- a place to stay and explore. That's where we found ourselves looking for Tubes. We found them, but the journey much more more interesting. The international partnership between Turkish Ceramics, The Architect's Journal and 6 of the best architecture practices around was a highlight. The Architect's Journal teamed up with Turkish Ceramics, who represent 37 Turkish ceramic manufacturers, to create a design challenge called "Kiosk". The word kiosk is derived from the Turkish "kosk" which translates as small communal space. And of course the brief included an aspect of water as well as the use of Turkish ceramics in the design. The clue was probably in the introduction by AJ's acting editor Rory Olcayto, "Kicking the Bottle". Water is beneficial for health and millions is spent on bottled water. Why not tackle the problem of readily accessible free water in a unique and environmentally friendly way. 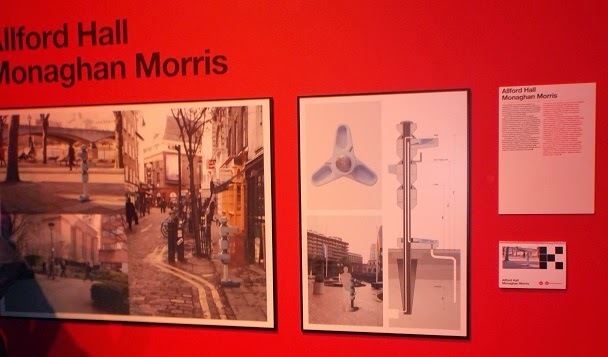 How could a water fountain be exhibited and used in 21st century London and by incorporating Turkish ceramics into the design. The wow factory definitely kicked in. How different could six architectural practices view something that's mostly sole purpose was to distribute water? How different indeed. 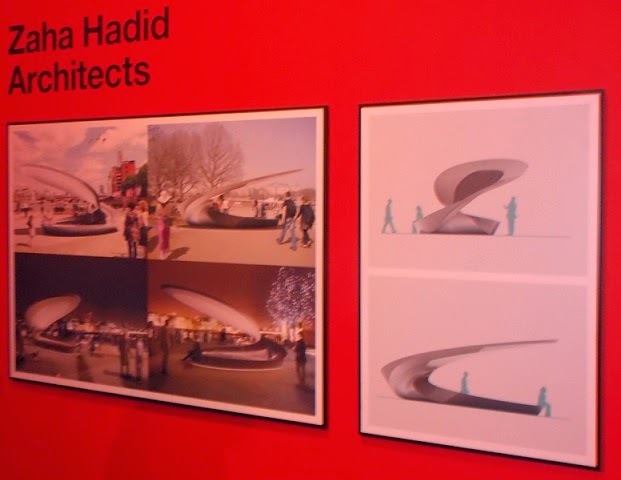 The architects in question were Allford Hall Monaghan Morris, Adam Architecture, Hopkins Architects, Eric Parry Architects, Studio Weave and Zaha Hadid. Each practice had its own unique take from single fountains that could refill water bottles and offer water to a dog, to elaborate fountains.